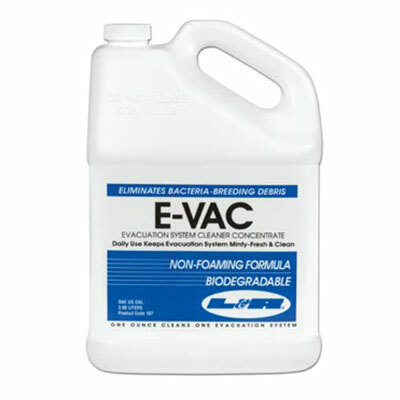 L&R E-Vac Evacuation System Cleaner Concentrate 107 is an easy to use non-foaming formula eliminates bacterial breeding debris. Now, cleaning evacuation systems is easy. First, use the E-Vac pump to dispense one ounce of cleaner concentrate into the E-Vac Pak. Add water to make one quart of solution, perfect for a single cleaning. Next, simply place the evacuation line into the E-Vac Pak and aspirate the solution through the system, including the high speed line, saliva ejector and cuspidor. Specially formulated to help dissolve organic debris, rope saliva and blood. In addition, the powerful non-foaming solution cleans away calcium build-up in the lines. Traps, pumps, drains and lines are left minty fresh without manual cleaning. In addition, the powerful non-foaming solution cleans away calcium build-up in the lines. Traps, pumps drains and lines are left minty fresh without manual cleaning. Makes 32 gallons of solution per bottle.